At 9:00 a.m. on July 18, 2008, the B-17 took off from Detroit according to Steve West, Beaver Island Chamber of Commerce. The harbor flyover will take place between 10:45 - 11:00 a.m. if the fog clears as it is expected to do. 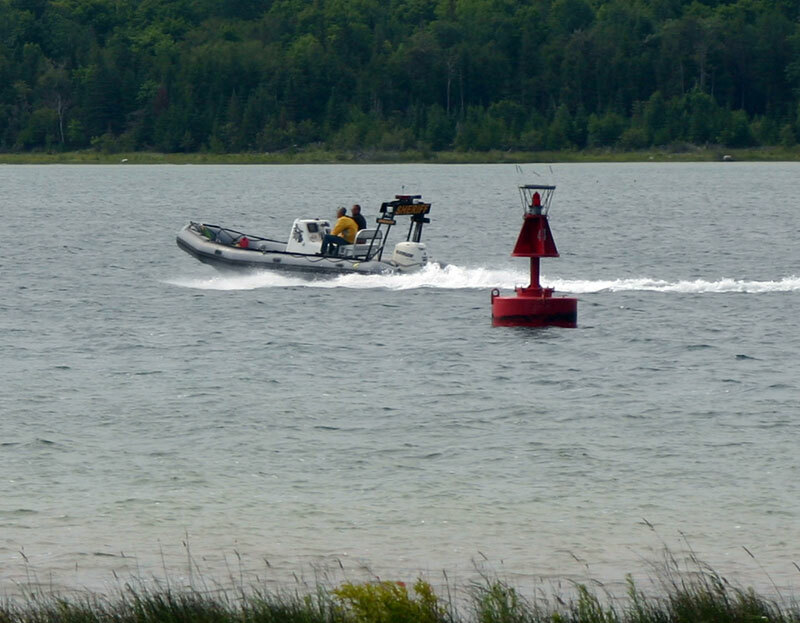 Alternate landing site is Charlevoix or other if necessary, and it will come to Beaver Island as soon as the weather permits. The fog is still causing problems as of noon. Steve West reported that the aircraft had landed in Traverse City. 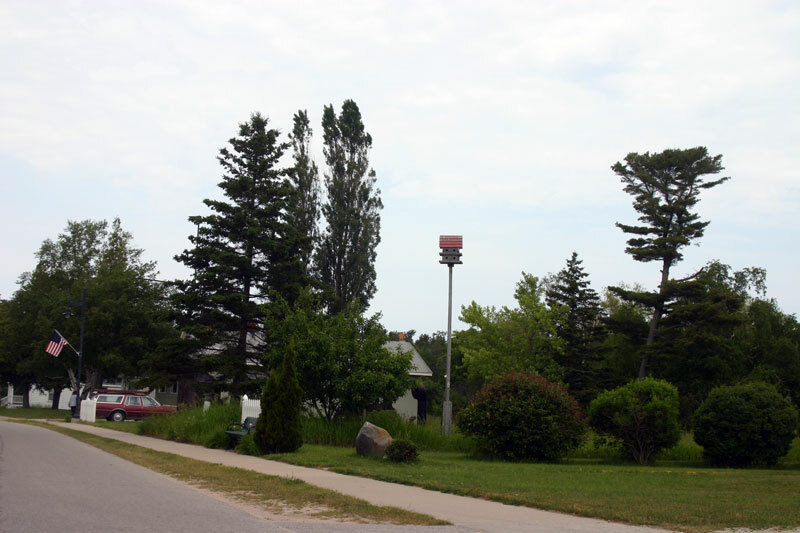 There was a possibility that the aircraft could be coming up to Charlevoix to wait an opportunity to come to Beaver Island. "No matter what, it will be at least two hours," Steve West stated. 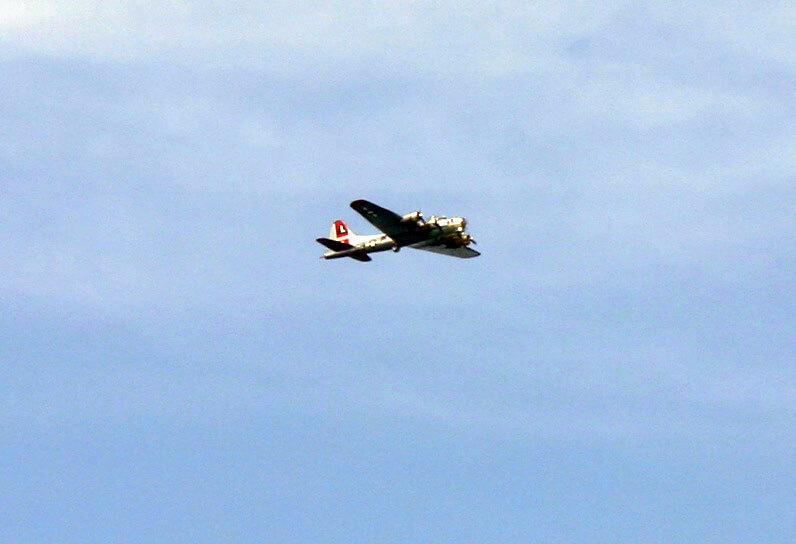 At 3:50 p.m., the B-17 flew over the harbor area, and then headed for the Beaver Island Township Airport. The aircraft will be taking some individuals for a ride, and then will be able to be viewed at the Beaver Island Township Airport. The Yankee Lady is sitting proudly on the tarmack at the Beaver Island Township Airport. 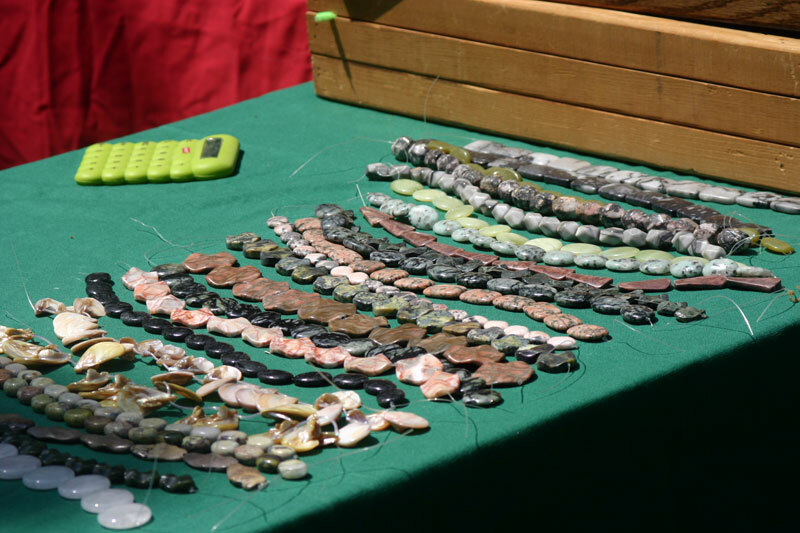 There are many interesting items to purchase being sold by the operators of the aircraft. There are cookies and muffins and barbecue pork sandwiches. The Lighthouse Fellowship and the Beaver Island Christian Church are selling baked goods, and Paradise Bay Coffee Shop is providing breakfast and lunch. The aircraft is waiting for the weather to clear to allow the $425 per person flight to take place. They have supporters who have signed up for the first flight and this flight is full. They may have a second flight as well if they get enough interested people. Board of Education Appoints Officers: At its July 14, 2008, Annual Organizational Meeting the Beaver Island Community School Board of Education elected the following officers from among its members: Barbara Schwartzfisher; President; Dawn Marsh, Vice-President; Sharon Nix, Treasurer; and Nancy Tritsch, Secretary. As part of the organizational meeting, all board members including trustees Brian Cole, Gail Weede and Tina Drost were assigned to the following committees: Finance, Building, Curriculum, Policy & Personnel, School Improvement, Beaver Island Youth Consortium (BIYC), and negotiations. Secondary Social Studies Position Posted and Filled Because of the recent resignation of teacher Marianne Brown, the school district sought applications for a 7-12 th grade social studies teacher. The position was posted at online at www.greatschools.com and on www.beaverislandforum.com . The district received over 50 applications that were sorted and reviewed. An interviewing committee made up of the Principal/Superintendent, two teachers, two board members and a parent then interviewed the six top candidates. Three candidates were invited back to teach a mini-lesson with five high school students followed by another round of questioning by the committee. Mr. Timothy Eaton, a Grand Valley State University graduate, was unanimously selected by the committee. In addition to completing the teacher certification program at Grand Valley , Tim completed undergraduate work at the University College Cork, Ireland, and earned his masters degree at the London School of Economics. Tim has all of the qualifications plus to teach secondary level social studies. It is possible that Mr. Eaton may also coach girls' basketball. Tim and his wife will be moving to the island in August. School Building Project Making Progress A revised timeline for completion of the new school building was discussed at the July 14, board of education meeting. The end date for the project remains very close to original expectations, but the date for earliest occupation of part of the building has changed. Optimistically it had been hoped that the K-8 and office wing of the building (Zone B on the drawings) could be occupied in time to start school in early September. The occupation date is now more realistically set for early November and plans are underway to secure appropriate learning spaces for the elementary students. Discussions are underway with the Community Center, the Beaver Island Christian Church, and Holy Cross Catholic Church to determine which spaces may be available and appropriate for use as classroom spaces. Attempts will be made to keep students in as few locations as possible. High school students were already scheduled to attend classes at CMU's academic center for the fall semester. Plans are being finalized for the use of a Charlevoix Public Schools bus to run a shuttle from town to the Sand Bay facility each school day. The gym will be available by late August for Volleyball Camp and practices. Soccer Camp and practices will be held on the O'Donnell property on King's Highway. In anticipation of the building project, home games for both volleyball and soccer were not scheduled until late September. An informational meeting with parents will be held on Tuesday evening, July 29, at 7:30 p.m. at St. James Township Hall for the purpose of answering questions and addressing concerns that parents will have with the proposed temporary housing of students. 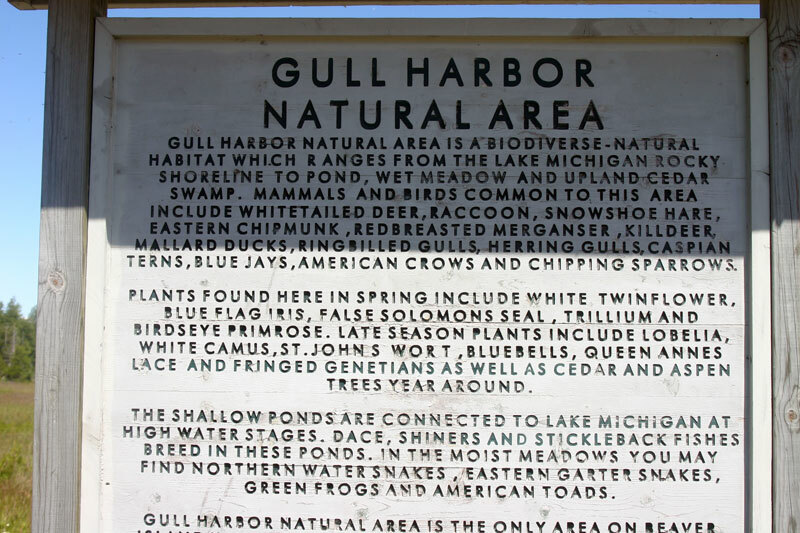 With all the discussion on Beaver Island about whether ORVs should be allowed on the township roads, all one has to do is take a quick trip out to Gull Harbor to see how some people can't or won't understand what a natural area is and can't or won't take the time to protect that natural area even less than 6 yards from the sign. The Chicago Basket will close the auction on August 1. Booking for flights, hotel...etc must be done 21 days in advance hence the early auction date. 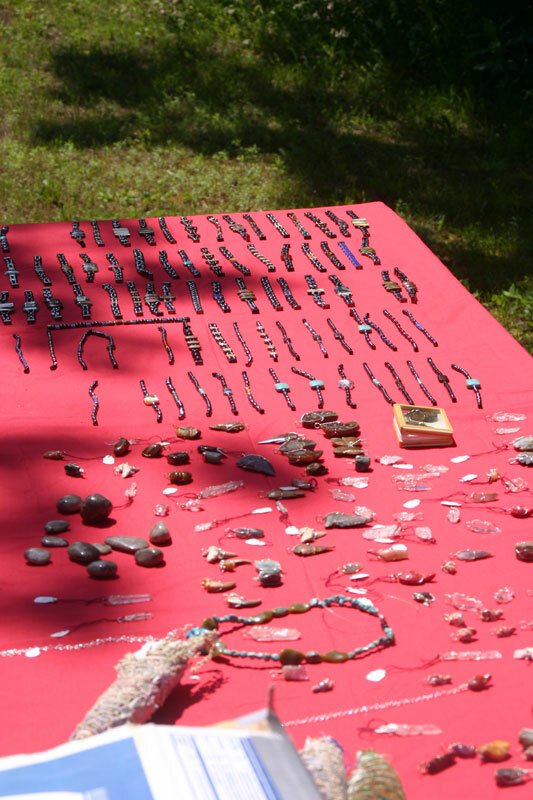 All of the others will auction off on Aug. 15. Winners will be notified within a day or two of the auction. They removed the tube from Ann's throat this past Thursday and she is very happy about that. She can now speak to everyone. They still have the feeding tube in her nose and have begun feeding her foods such as applesauce, pudding, mashed potatoes and squash. She was not happy with the mashed potatoes or the squash! They hope to remove the feeding tube after next week. She is still progressing slowly. They had her on a drug for depression which was interfering with he ability to think and respond clearly. Thank goodness Ann's daughter Tammy has been there to observe this and get her off of that medication. Thanks again to all of you for your continued prayers, care and concern. I have put together some of her belongings and all of the cards that were sent recently and a friend of the family is here on the island and will be taking her things to her this weekend. They hope to begin the tougher physical therapy in a week or so. Ann's children have hung all of the cards around in her room and she loves it! Ann has been in the rehab center since Friday evening. She still has a tube attached into her trachea. This tube cannot be removed until Ann is able to clear her throat on her own, to avoid choking. They hope to remove it in a few days. She is still trying to speak and with the aid of a small device that gets attached to the tube in her trachea, she can speak a little, but she is still weak. She can move all of her limbs now. This has been a slow process and is very frustrating for Ann. She has no feeling in her legs but hopefully this will come in time too. Her children have asked me not to give a current mailing address but rather ask you to please mail cards to: Ann Zanella, Beaver Island, MI 49782. I will collect the cards and send them to her. Please continue praying for her full recovery. 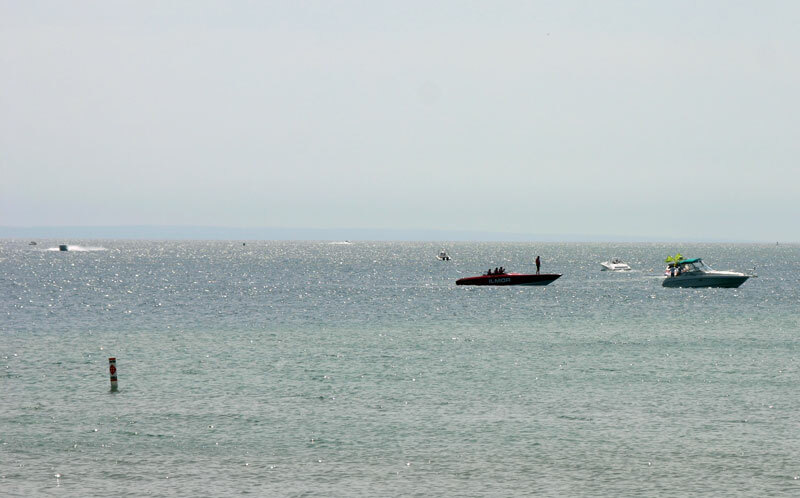 The arrival of the Boyne Thunder boats did not slow down the sailboaters as they also came into the harbor and were anchored out. Many were looking for dockage, but the docks were full. If you have not seen this boat in action, (and it has been busy over the last couple of weeks), this picture allows you to get an idea of what the boat looks like. Twice in the last two weeks, the boat has rescued people from Garden Island. Great job, rescue boat crew! Thank you for your efforts and skill! This phrase will become better known as the summer continues. 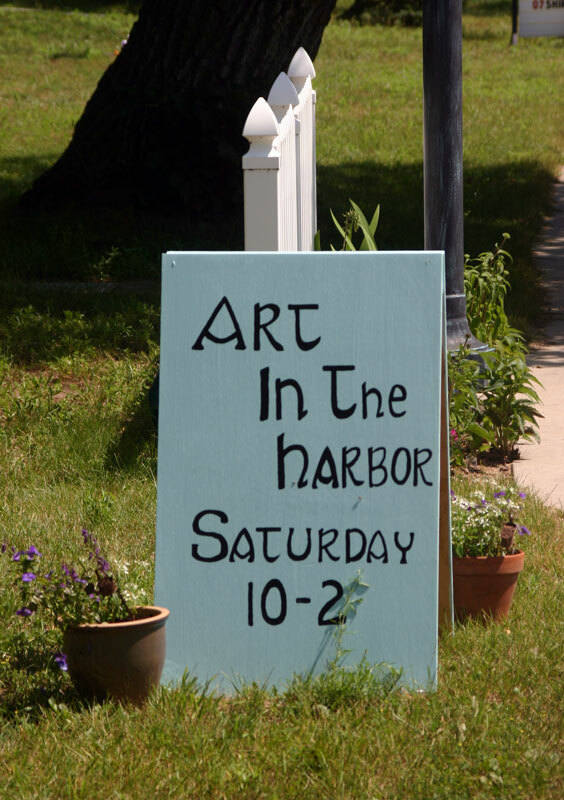 Saturdays, from 10 a.m. until 2 p.m., local artists, craftsmen, and photographers display their efforts in the vacant lot next to Lisa Gillespie's home and gift shop. 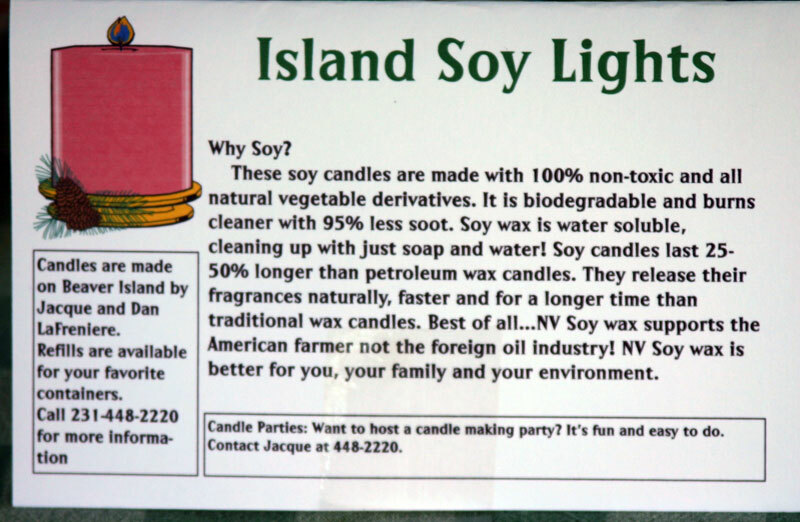 Jacque LaFreniere and son Dan are making soy candles. 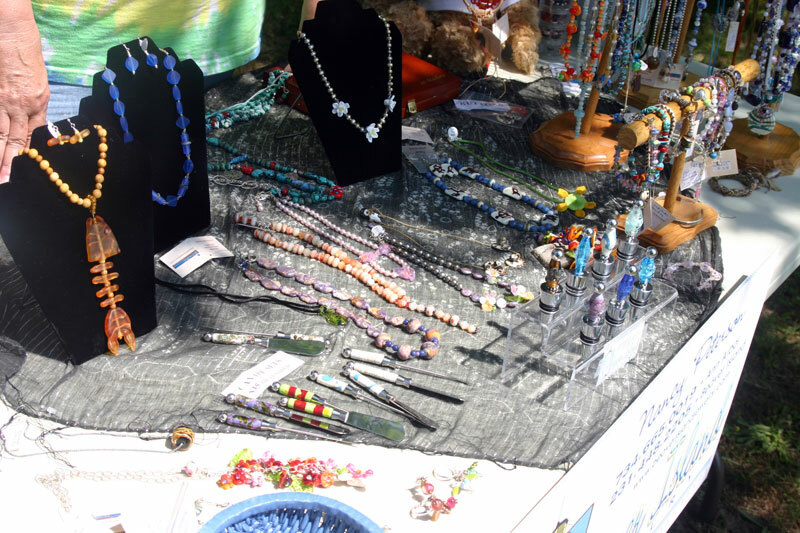 Nancy Peterson displays her jewelry. 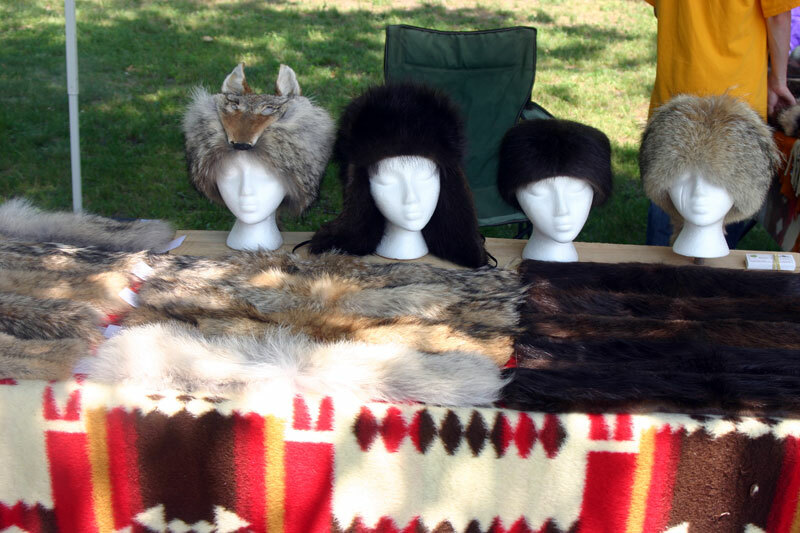 Mark Valente displays his wildlife products. Stop by next Saturday and check out all the talented people and the wonderful items available! Rita Gillespie needed products available from the blood that you can donate. One donation can help several people. Please consider donating blood at this blood drive coming soon at the Beaver Island Christian Church. The blood drive takes place on Thursday, July 31, 2008, from noon until 5:45 p.m. The Rita Gillespie Memorial Blood Drive is sponsored by the Beaver Island Christian Church, Holy Cross Catholic Church, and St. James Episcopal Mission. The blood drive will take place in the new Gregg Fellowship Center. all presenting donors can enter to win NASCAR race tickets and a $500 gas card. For details or information contact Lars Larsen at 231-448-2470, Jean at 448-2893 or Connie at 448-2379. 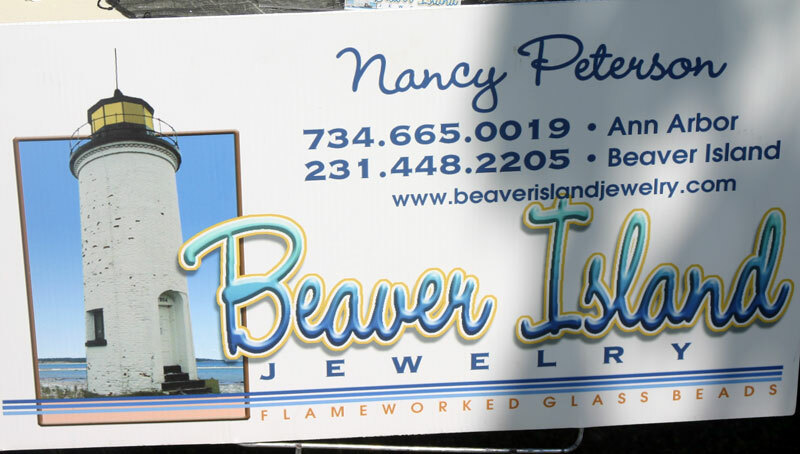 Additional support comes from Island Airways and the Beaver Island Boat Company. 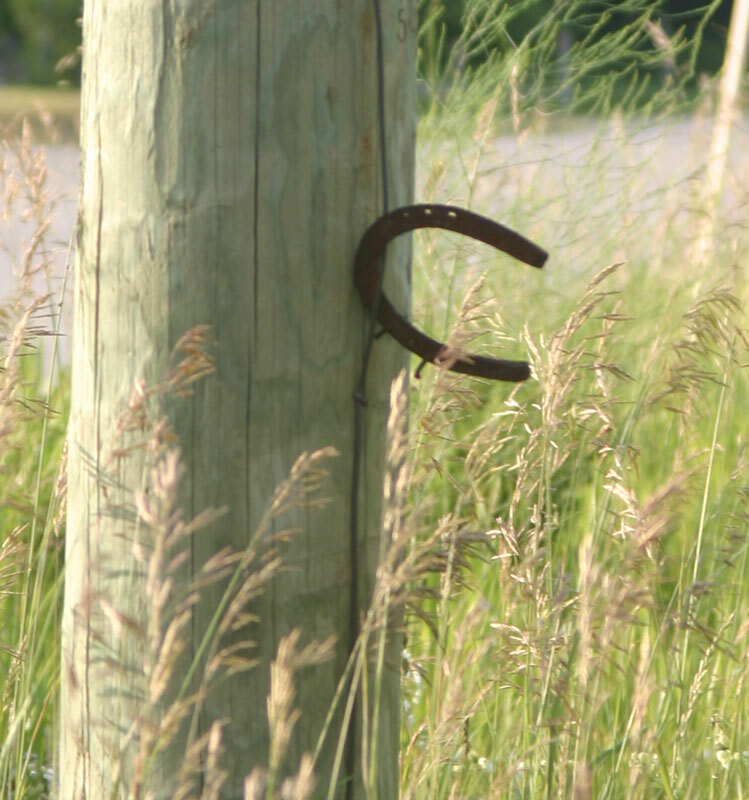 BEAVER ISLAND AVMETS POST 46 IS OFFERING A $1000 SCHOLARSHIP TO ANY STUDENT WHO GRADUATED FROM THE BEAVER ISLAND COMMUNITY SCHOOLS AND HAS COMPLETED AT LEAST ONE YEAR OF POST-HIGH SCHOOL EDUCATION. Welcome to Our Newest Business Supporter! 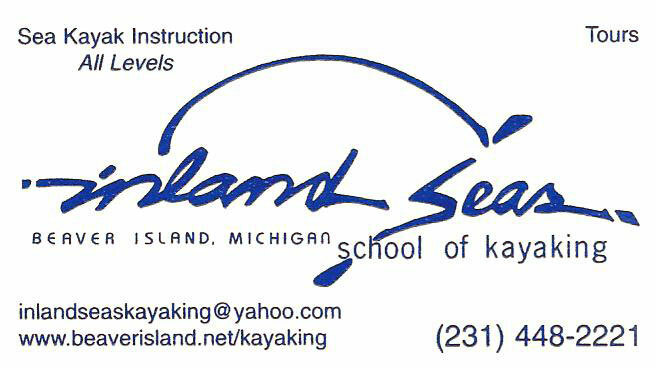 Welcome to Inland Seas School of Kayaking! The resolutions below were passed by unanimous vote, with all 9 board members present and voting, on 7-14-2008. By a unanimous vote the Beaver Island Chamber of Commerce Board of Directors strongly believes that the effort to reduce the number of Double Crested Cormorants in the Beaver Archipelago must be continued. 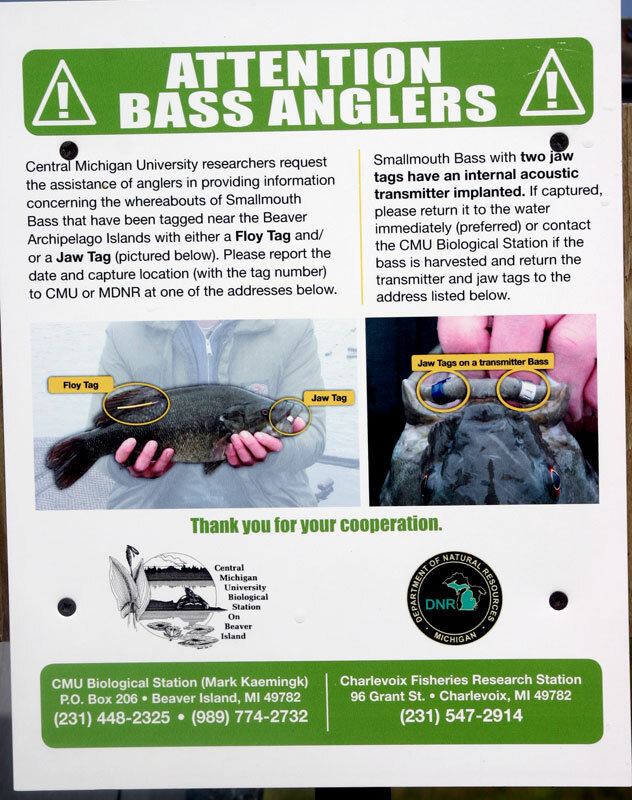 By unanimous vote the Beaver Island Chamber of Commerce Board of Directors requests that the DNR consider 3 years of catch and release artificial bait only regulations for small mouth bass in the Beaver Archipelago followed by slot limit regulations that would allow anglers to keep a trophy fish and small number to eat. 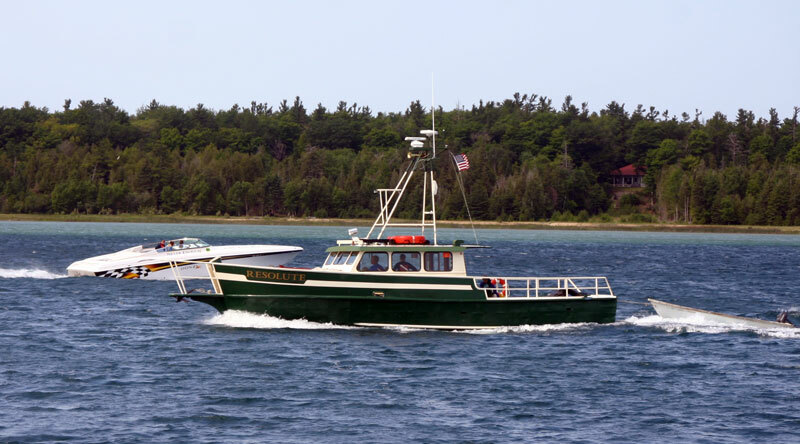 Our goal, working with the Beaver Island Wildlife Club, is to return the area to the world class small mouth sport fishing destination it once was. We Are Moving Into The New Community Center. Your Chamber office will relocate to the new Community Center in July. The beautiful new space is just to the left as you enter the building. Attention accommodations members: If you have open dates in July and August email your chamber office. Question about how room finders works, call (231) 448-2505. The B-17 Yankee Lady will make a low pass over Paradise Bay at about 10:00AM on July 18. We have an unconfirmed report from a usually reliable source that she will be escorted by a P-51 Mustang fighter. What a sight it would be to see both bomber and fighter fly over Beaver Island. On Friday, July 18, 2008, at about 10:00 AM the Yankee Lady B-17 will make a low pass over Paradise Bay prior to landing at Beaver Island's Municipal Airport. There is an unconfirmed report that she may be escorted by a WWII fighter. A number of other vintage aircraft plan to attend the Beaver Island Air Show July 18 and 19 if the weather is good. 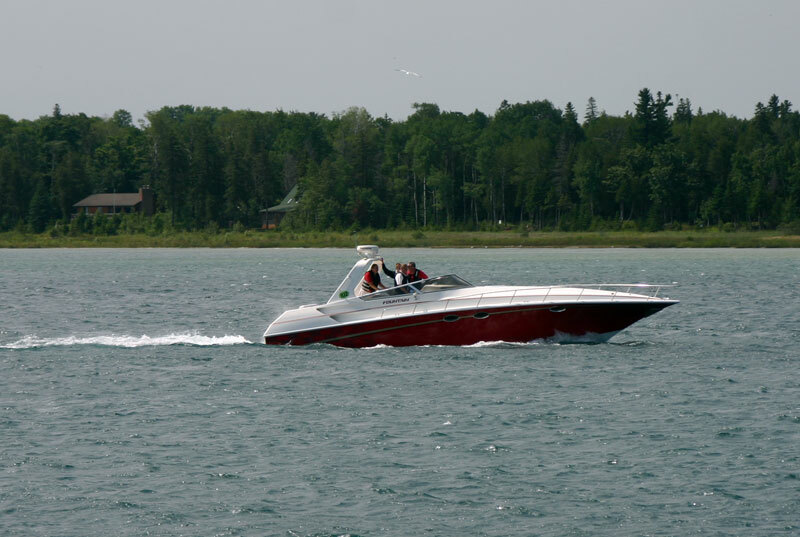 The high performance power boats of Boyne Thunder visited Beaver Island's Paradise Bay on Saturday, July 12, 2008. 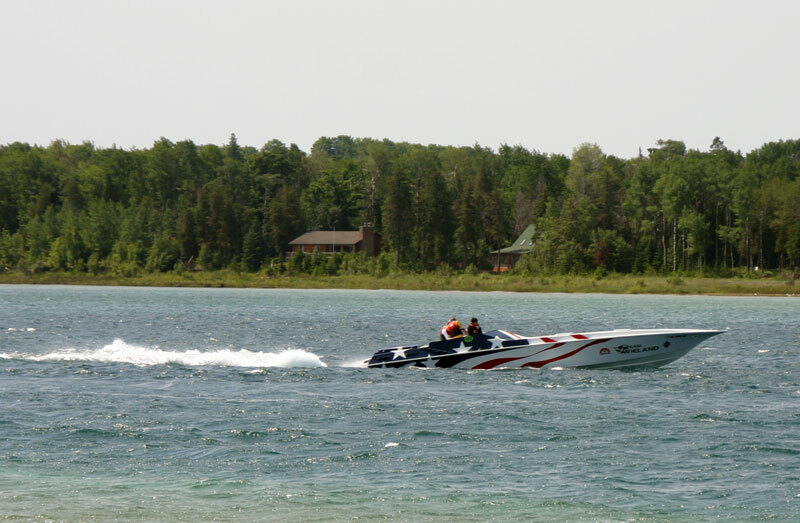 The Poker Run that benefits Camp Quality begins in Boyne City with a staggered start and a reduced speed trip down Lake Charlevoix. Once they hit Lake Michigan they bury the throttles. 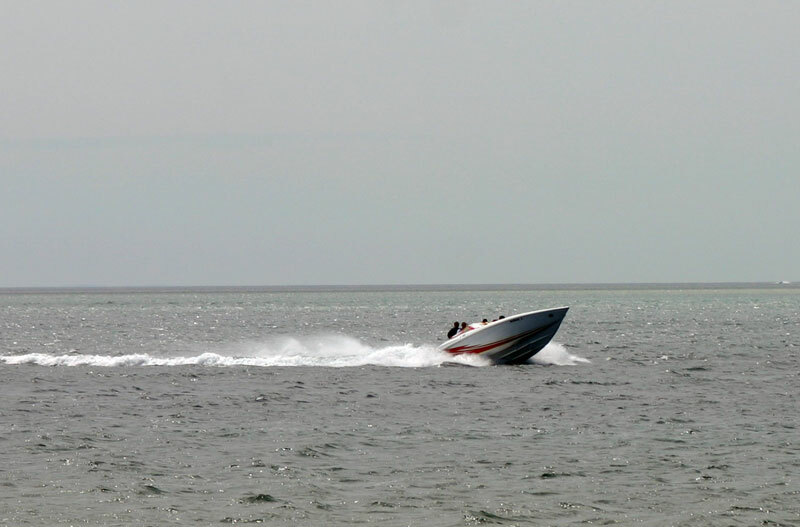 Some boats top 100 mph. 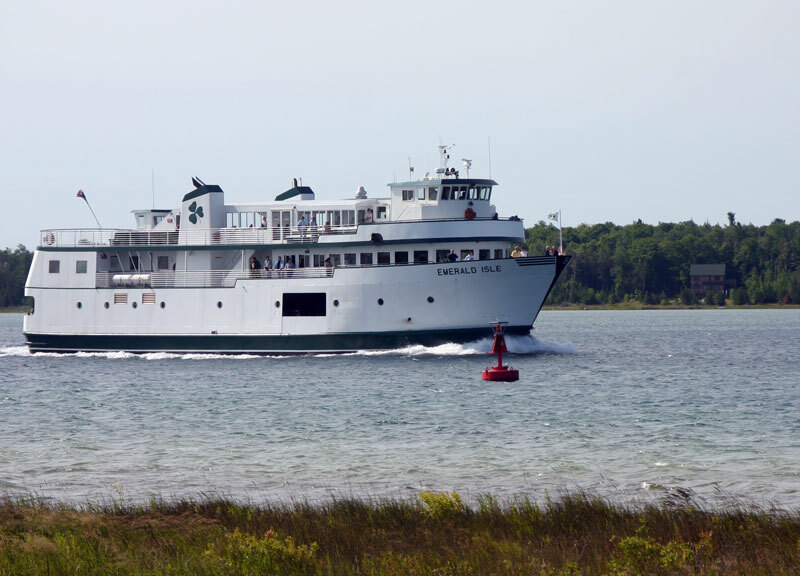 The first boats were expected to arrive at Beaver Island about 10:30, but the first boat did not arrive until 11:25 a.m., just as the Emerald Isle was beginning its return trip to Charlevoix. 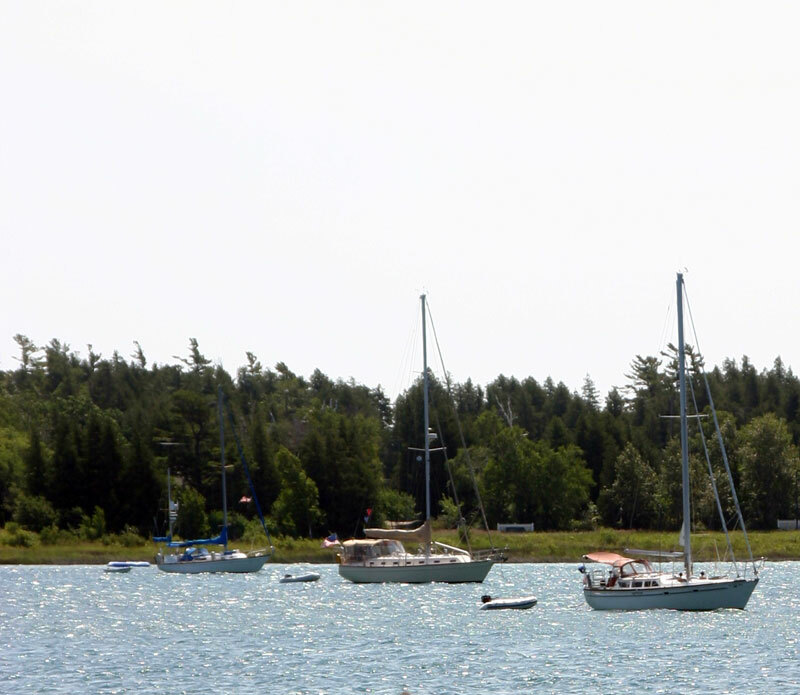 This year Municipal Marine Harbor Master Jim White took over the duties of arranging for a volunteer card boat that was anchored in front of the Marina. 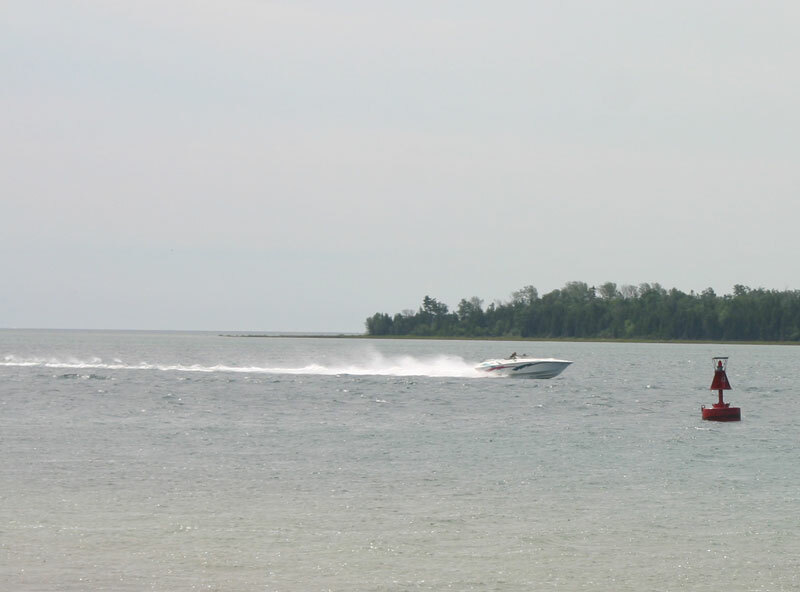 People were gathered at Whiskey Point to observe the Boyne Thunder boats come into the harbor. While there was a delay due to weather and waves, those gathered at the point were able to see the Emerald Isle come in. 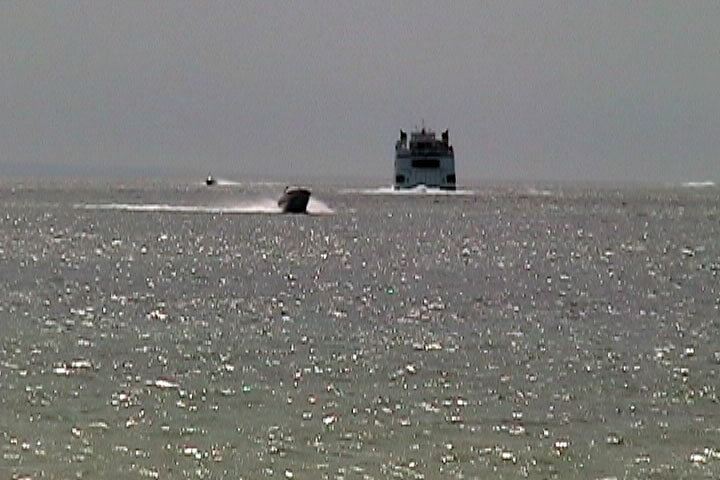 Only one boat came into the harbor before the ferry began its return trip to Charlevoix. You can see them coming in this picture. 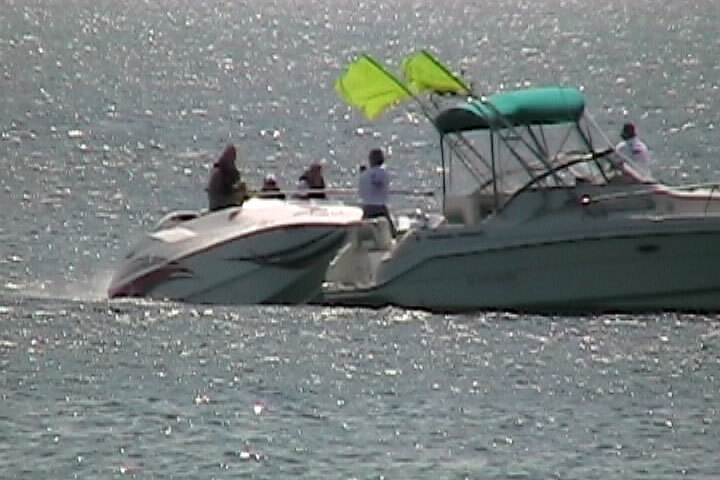 Here is a closeup of the boat picking up a card. 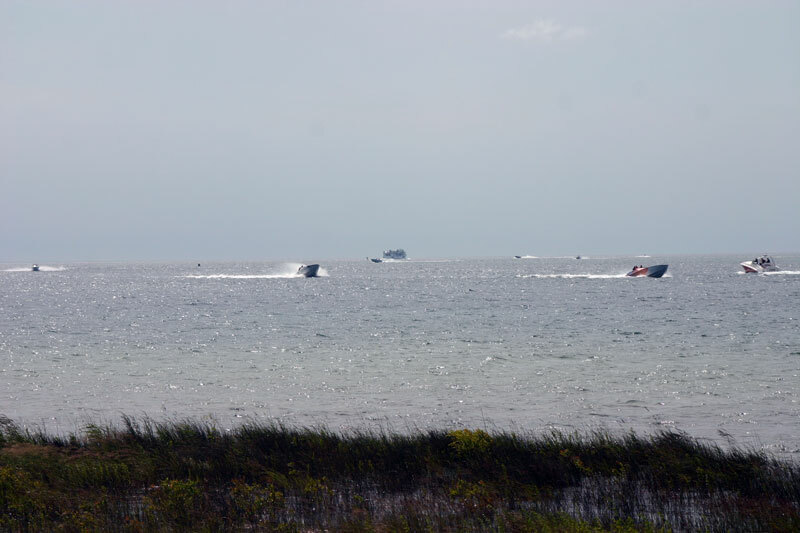 While the speed boats entered the harbor, this normal work boat just continued on its planned course. Left--one of the first boats into the harbor, and another and another. 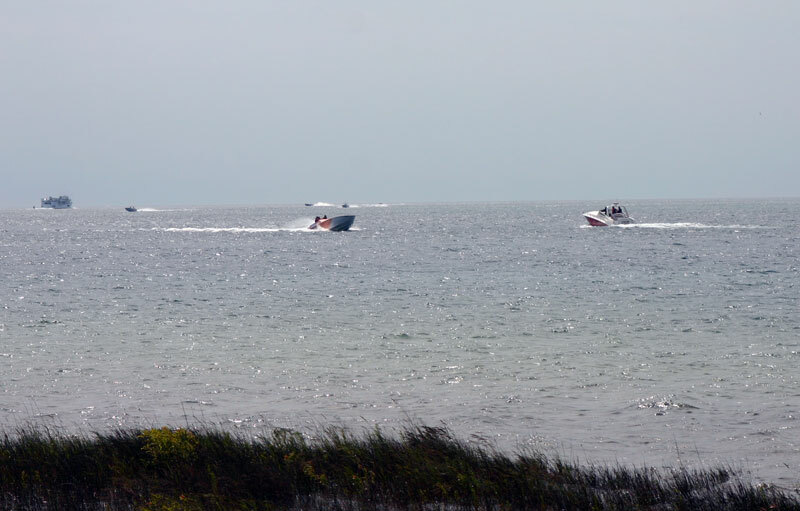 For a short period of time, the harbor area was alive with these speeding boats, but they all slowed down when they saw the CCSD Rescue Boat. This is the last Hazardous Material Day for this year. In what month and year did the Beaver Island Community School celebrate the last show of M. A. S. H.? No one answered this question. Perhaps, we're all getting too old to remember things? This was in February of 1993 as reported by the Beaver Beacon, fifteen years ago. There were many who dressed up for this affair, which was held in the Holy Cross Hall. This leads to the next question which is about the celebration. The first correct answer will earn a gift subscription to News on the 'Net for the months of August, September, and October for the person of your choice, anyone who is not already a subscriber. Email your answers to: medic5740@gmail.com. 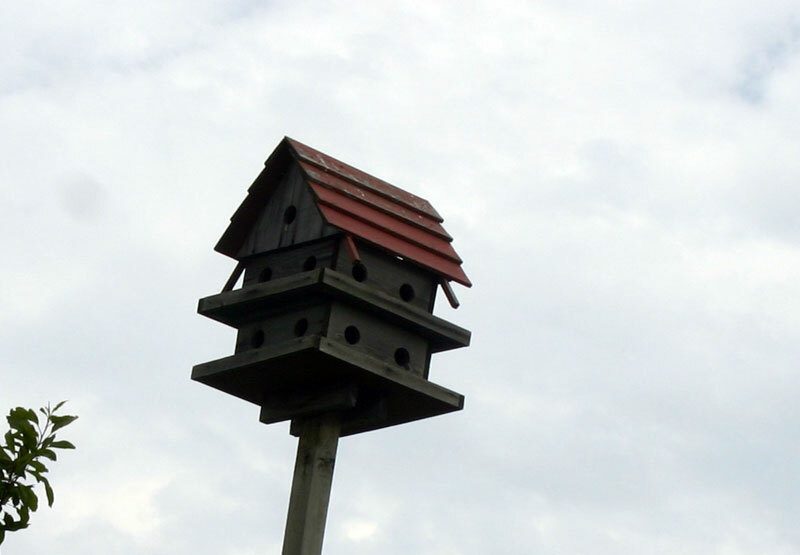 This bird feeder is seen by all as they drive to " The Point" and back, referring to Whiskey Point. It is across the street from the Marine Museum. See if you are observant. Test your observation abilities. Do you know where this is? This attraction is separate from the Lighthouse School and will be held on a different day so both attractions can be enjoyed by all. Is anyone willing to donate the use of their home, preferably an older farm house, or does anyone know of a good possible location for a community haunted house for this October??? The building has to be safe and sound, this means, no electrical, plumbing or structural problems. In the event that a suitable structure cannot be located we will still need the use of a vacant or wooded lot, preferably near town. A one time event insurance policy or a a rider on an existing insurance policy will be in effect to cover liability. This attraction will be very scary and may be inappropriate for younger children.. There will also be a Halloween story writing contest to help come up with the story and theme for this years haunted house or haunted attraction. 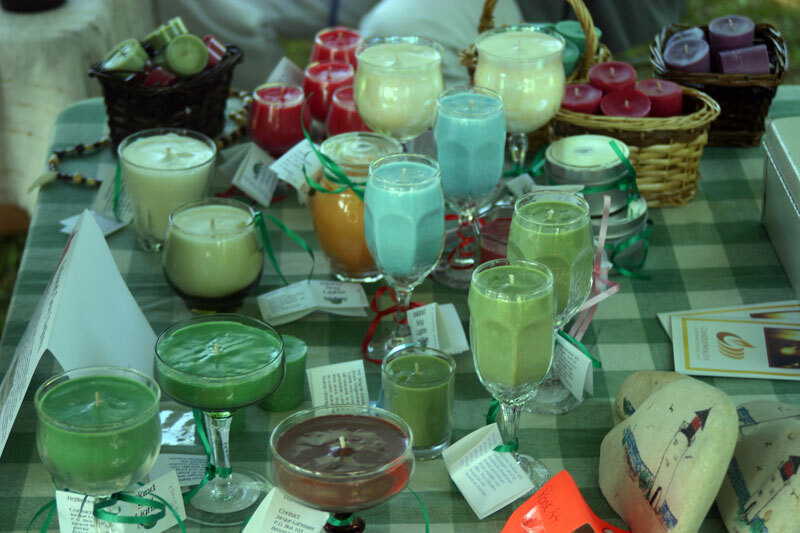 The contest is open to all 7th through 12th grade Beaver Island Community School students. A meeting will be held at The Beaver Island Community Center in "The Hangout" this August, to go over the guidelines of the contest. Watch for an announcement on this website and flyers in town, as to the date and time of the meeting. Anyone wanting further information, please call Anna Martell at 448-2652 or Tina Walker at 448-2020. The minutes of all public meetings will be posted as soon as they are received. News on the 'Net welcomes minutes to all public meetings. All organizations are welcome to submit meeting minutes for publication on this website. Please email them to medic5740@gmail.com.